Dubai: The UAE’s national organ donation programme received a major boost with the launch of a deceased organ transplant digital registry on Wednesday. His Highness Shaikh Mohammad Bin Rashid Al Maktoum, Vice-President and Prime Minister of the UAE and Ruler of Dubai, launched the ‘Hayat’ registry at the Ministry of Health and Prevention (MoHP) pavilion of the Arab Health forum on Wednesday. Hayat will use blockchain technology to create a database, allowing both nationals and expatriates to express their wish to donate organs after their death, by registering for the programme. It is a free-of-cost App that can be downloaded on smartphones on IOS and Android platforms that will create a vast database of organ donors and potential recipients throughout UAE, and will be linked to all public and private hospitals throughout the country. Dr Obaidly added that in 2016, the Mohammad Bin Rashid University had conducted a nationwide survey which indicated that nearly 68 per cent of the population had shown readiness to donate organs after death. Dr Rakesh Suri, CEO of the Cleveland Clinic Abu Dhabi said that ever since Health Law No: 5 was passed in 2016 to facilitate cadaver organ donation, the programme has progressed rapidly. In an exclusive interview with Gulf News, he said: “Our hospital had been at the forefront working closely with the Ministry of Health and Prevention and the Department of Health Abu Dhabi to conduct transplants. “Since 2017 we have conducted 43 transplants that include both cadaver and live organ donations. “This has been made possible because of the smooth working of all stakeholders such as the government bodies, the hospitals, the national organ transplant committee and our other partners in Saudi Arabia. While being briefed on the Ministry of Health and Prevention’s programmes, Shaikh Mohammad launched the National Programme for Organ Donation. He then stopped at VBS Pharmaceuticals’ pavilion and was briefed about its operation and products. 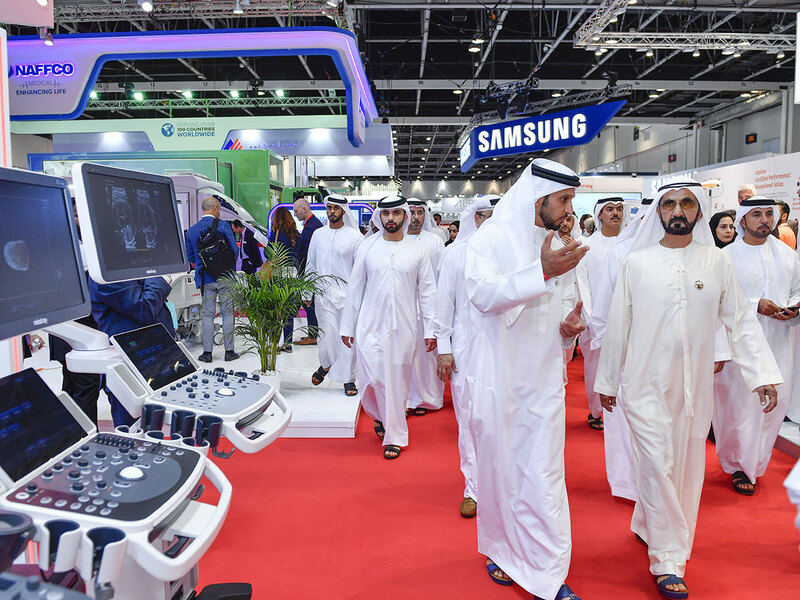 He also visited Dubai Health Authority’s pavilion, where he was introduced to its latest initiatives and smart solutions including the Tawreed Artificial Intelligence (AI) System. Shaikh Mohammad expressed his satisfaction with the exhibition, which reflects the interest of the world countries and its affiliated companies in public and private sectors in participating in the exhibition to display and market their products and innovations of medical and health equipment that is used to serve the human and health care. UAE residents can download the Hayat App and register with all their details including name, nationality, gender, blood type and other health information, while also pledging their organs for donation. If a registered resident is declared clinically dead following an accident or illness, doctors at the hospital will have consent through the app and be able to harvest organs pledged for donation. Recipients who are a likely match can also be identified via details stored through the system. Cadaver organ donation can save up to eight lives with donation of eyes, liver, heart, lungs, kidneys, pancreas, small intestines, skin and other tissues.